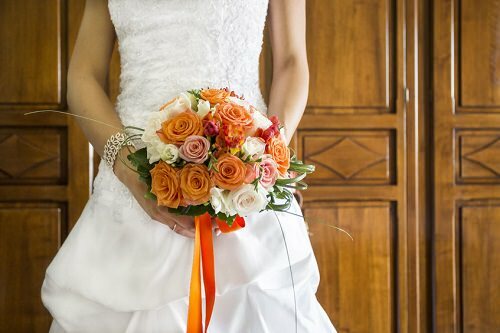 Although you can still have a white or ivory gown, considering adding color to your wedding wardrobe. Choose a pale orange or peach gown that allows you to show off the remainder of your glowing summer tan before it fades. If you’re a bold, dramatic bride, opt for a black gown that makes a serious fashion statement. Jazz up a black or white suit or tux, whichever your groom prefers, with accents of Halloween color as well.